The fossil of “Joe” preserved more than bones—careful excavation and preparation revealed patches of skin and even part of the beak. Skin impressions were found around parts of the hind foot, showing a pebbly skin texture on the heel. The skin was slightly folded, as would be expected in an area that was flexed and extended with each step. 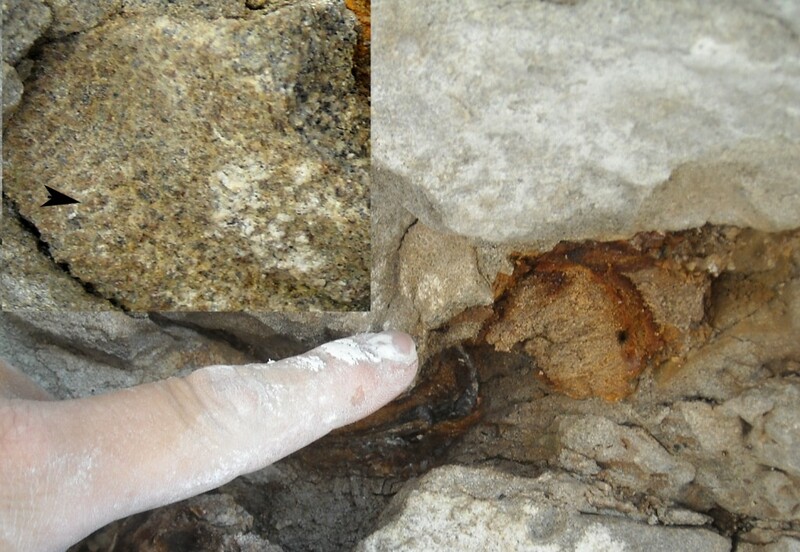 Careful searching around the rest of the skeleton did not reveal any other obvious skin impressions, although some rock structures suggest poorly preserved soft tissue. Because only the impressions are found, we do not know what color the skin was during life. Skin impressions found with “Joe”. 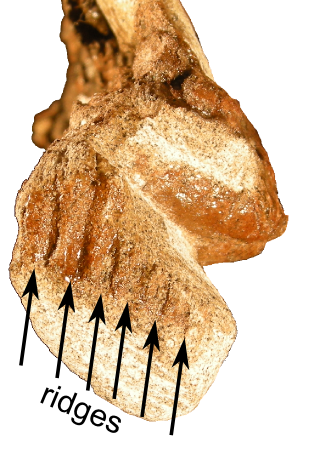 The larger image shows the bones of the hind foot (brownish-orange), with the finger pointing to the area of skin impressions. The inset image in upper left shows a close-up of these impressions. Note the pebbled skin texture, typical of many plant-eating dinosaurs. Close-up of the beak region of the skull of “Joe”, showing the ridged impressions of the keratinous beak. During the cleaning of the skull, the preparator uncovered an odd series of ridges in the rock near the bone surrounding the mouth. Additional work showed the ridges were the impressions of the inside of the beak! Just like turtles and birds, the bony beak in “Joe” was augmented by keratin (the same material our fingernails are made from). This keratin would have formed a sharp cutting surface for chopping off plants. Importantly, “Joe” shows that the keratinous beak extended far beyond the bone. The external appearance of “Joe” was much different from what the skull alone showed.